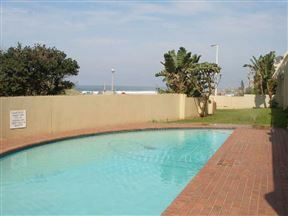 Isikulu 27B is located in the Isikulu complex set in Umdloti Beach. This complex is directly opposite the beach and allows for amazing views of the ocean. There are two bedrooms in this self-catering apartment. The apartment is open-plan and the kitchen leads to the lounge area which leads onto a balcony with beautiful seaviews. The kitchen is fully equipped and has a fridge, an oven and a washing machine. The lounge has comfortable seating and includes a television. Guests are welcome to make use of the communal swimming pool. Parking for two vehicles is available on the premises.